But, not all teddies were created the same. Some were pulled from the darkest realms where dreams become nightmares and even the softest, sweetest of comforts have a surprising bite and insidious stare. These are the haunted teddy bears! If you are brave enough to face down the horrific woods to locate the hidden locale where the Cursed Ursus dwell — right next door to the Teddy Bear Picnic site, actually — you may have the guts to bring home this Haunted Bear. This adorably soft, cuddly bear reveals its haunted soul with gleaming red eyes and an underbite that would take down a real bear! This guy is plush with murder! Not all teddy bears are made with the same stuffing! Given love and attention, they might be protectors of bedtime. But, when spooky movies fill their hearts, these Haunted Bears are pretty terrifying! 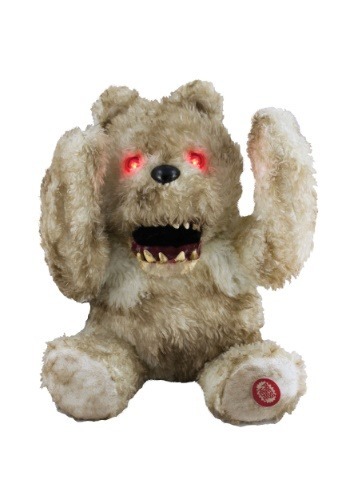 Fortunately, you've no doubt got the gumption to take this terrible teddy and turn the table. Even evil bears can make great friends!